WACKY WINDOWS AND NEW/OLD LIGHTING | Nan Tubre Writes . . . Anybody like Pintrest? I do too. In fact, I like it so much, I’ve manmaged to get myself into some rather tight places because of . I blame it on the projects I see other people pin…I want to do them all. I never think I can’t do it. If I like it enough, it will be done. It is easy if you do it right. Measure twice, (or more) cut once. Don’t do like I did and lay the mini-blind on top of the fabric and cut around it. That doesn’t work. You will have to start over with another panel. And don’t believe that you can spray glue a room darkening panel onto the fabric. That doesn’t work either. And I’m not so sure I should have used a hot glue gun instead of fabric glue. The hot glue tends to melt the plastic mini-blind slats, to say nothing of how HOT glue will blister your hands even through the fabric. ’nuff said, you get the point. 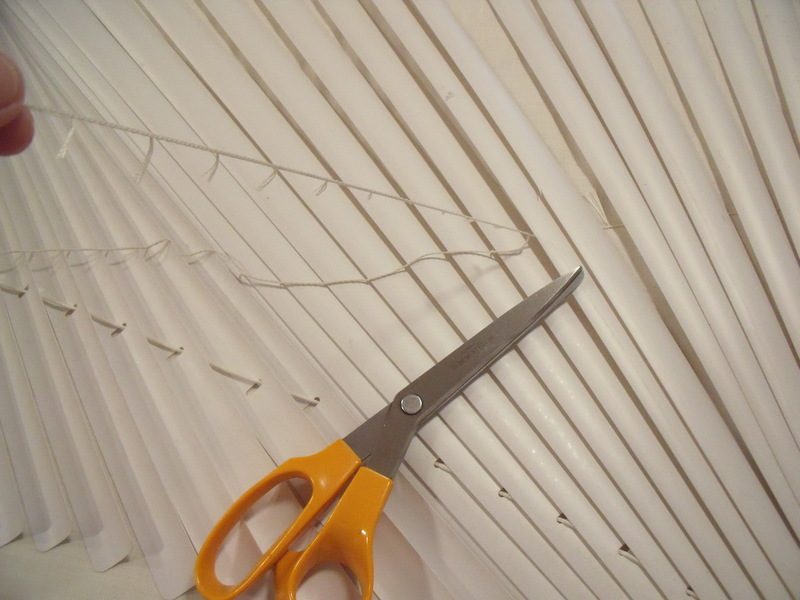 Start off with a panel of fabric measured correctly to the size of your mini-blinds. Make sure you leave a two-three inch border. 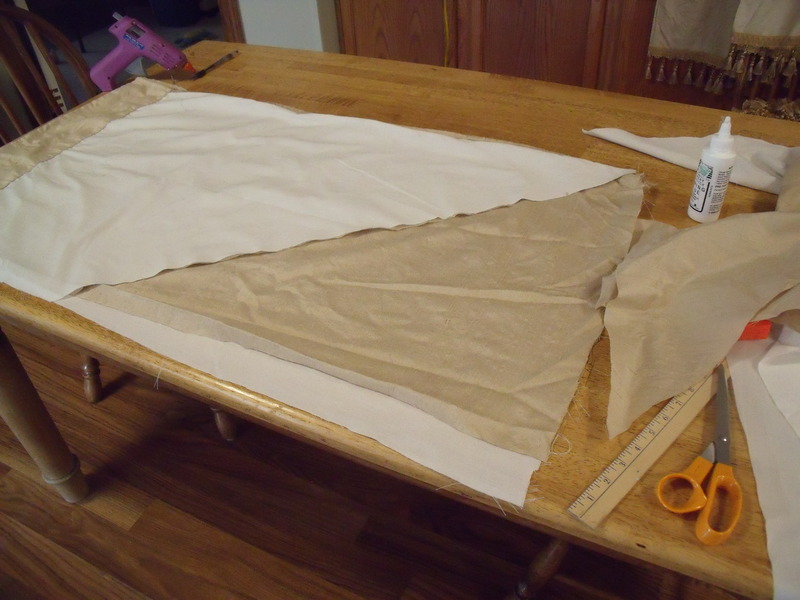 Fold the border in to finish all sides and glue them or use hem tape to keep them in place. Again, I used hot glue. I don’t recommend it. Once you have the fabric panel the way you want it, lay it face down on the table and lay the mini-blind on top of it. Make sure the bind is extended as far as it can go and cut out that little string thingy that holds the slats in place. DO NOT cut the string that pulls the blinds up and down! After you do that take the end piece completely off by popping out the little tabs on the bottom that the string goes into. You will see the end of the string tied into a knot. Pull that out and remove the bottom bar off. Remove all but 6 or 8 slats. Measure down how many folds you want in your roman shade and place these left over slats at every interval, cup side down. 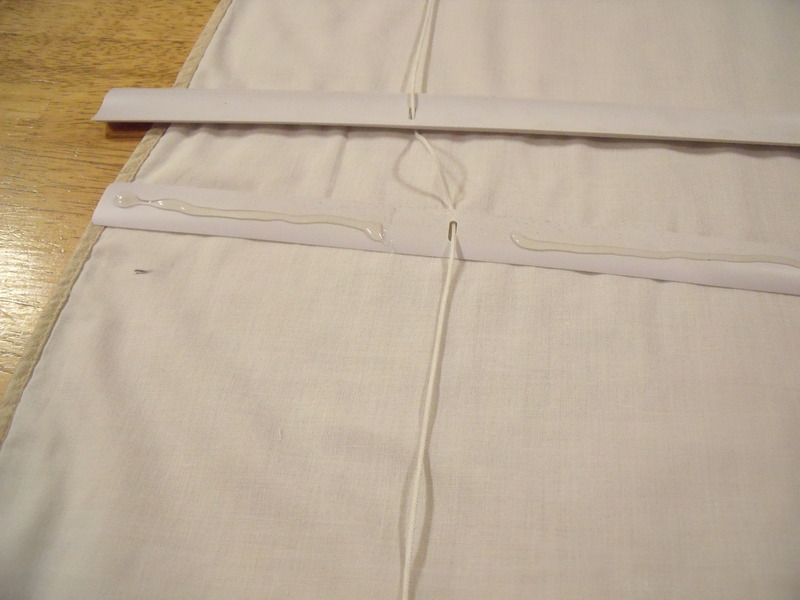 Run a bead of glue along the slat and turn it over onto your fabric. Be sure NOT to get any glue on the string or you will have royally screwed the whole project up. Repeat until you have each slat in place. A better idea would be to glue two slats together and use that instead of one. Seems like it would be more durable. I wish I would have thought of that before. Anyway… When you get to the end, poke the string through the holes on the bottom bar and tie knots in them just like they were before you took it apart. Now keep in mind that the strings that pull the shade up and down will be on the BACK of the shade, but that won’t matter at all. It still works. Before you know it – Voila` – done deal that took only an actual hour of labor from start to finish if you don’t make very many mistakes. Now…this is where things got complicated for me. 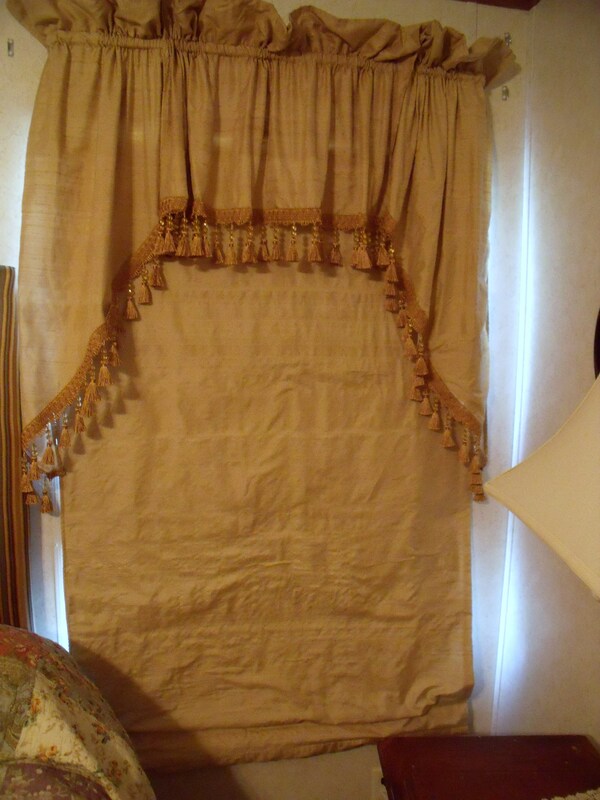 I decided to take the leftover curtain fabric and make a valance complete with trim that included tassels. Lots of beautiful tassels. It didn’t take long. I pulled out the hot glue and consider my work a success because I only blistered two fingers. I love the way the tassels looked on the silk blend fabric. So shiny! So there, how do you like them? 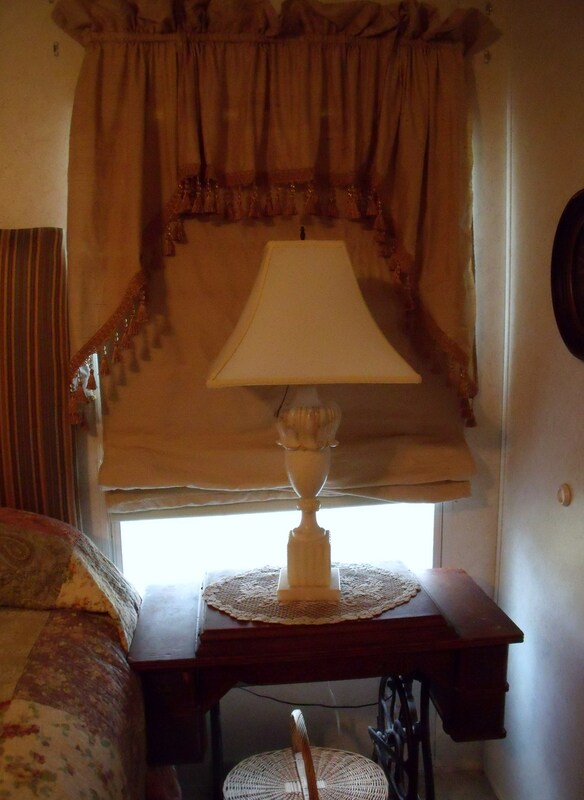 The roman shade is ok, but I don’t like the valance. But after all that work and all those tassels, I’m leaving them like they are until I can not bear it any longer. It won’t be long. At least the beautiful lamps I inherited from my mother really, really look good against them. 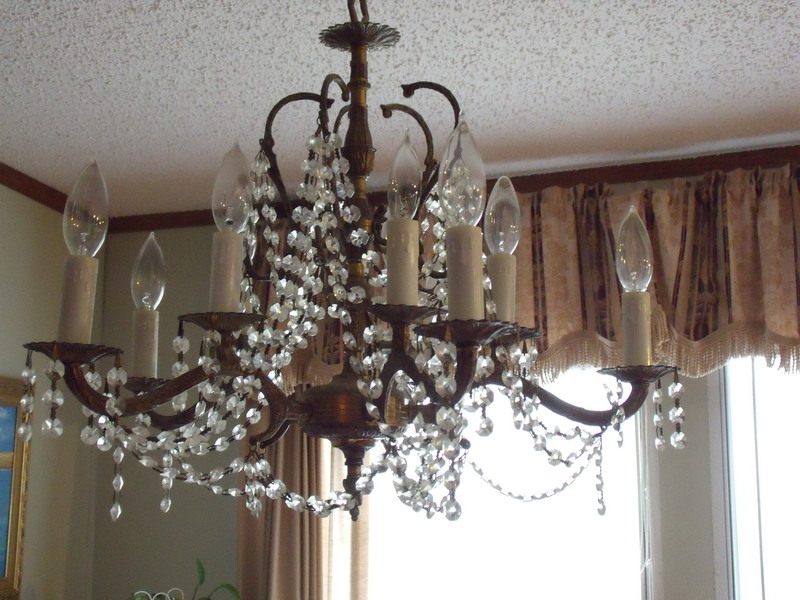 with this: We picked it up from a place near Inglewood Plantation (here in Louisiana). 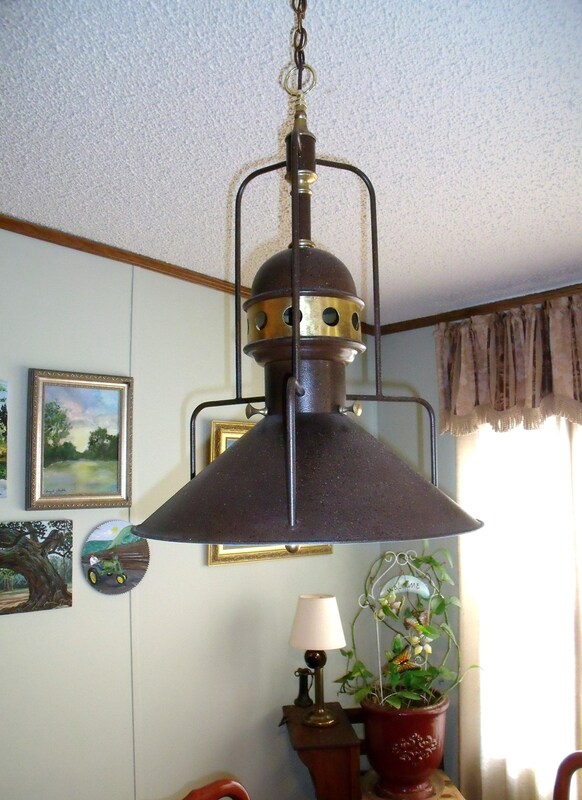 As far as I am concerned it is perfect for that antique industrial look I’m going for. Now I have to figure out what to do with my Queen Anne style table and chairs! Please, pretty please leave a comment. I love hearing from you. In fact, you would be doing me a huge favor if you would ‘like’ and share my blog too! God is good, folks. Don’t forget to pray for peace. « Let’s talk about commercials for a minute…. U can do anything u try nan. Wow what a gift. Love the new light. Love u.
I love it. You sound so much like me. But I know now this is not a project that I want to do. I also don’t go on Pintrest because I would want to try something like this!!! You are more talented than I am. You go girl. Good luck to you Nan, it sounds like you’ve embarked on a project to make over the house…with your energy, enthusiasm and ability, who knows where it will end!